On the one hand LED's made an incredible power boost. A modern lamp squeezes far more than 200 lumen luminous flux out of a single R6 round cell (AA-battery) and a single high-power LED. 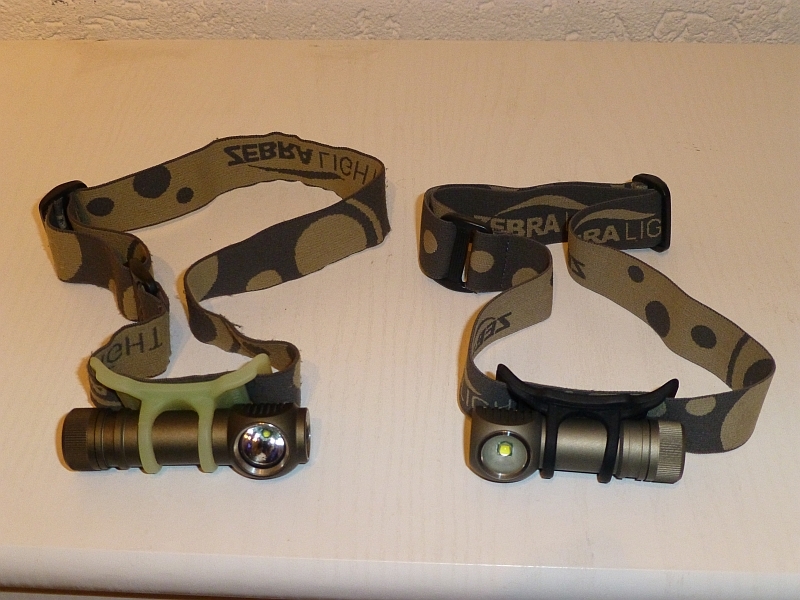 Meanwhile we use headlamps from Zebralight. These are indeed comparably expensive but also the quality is beyond comparison to a low-priced headlamp from the supermarket around the corner. These lamps have an all-aluminium housing, are waterproof, small and lightweight, come with a comfortable headband - and deliver a smashing amount of light. A huge assistance! Of course there are even brighter lamps - however these are bigger, heavier and require more batteries - and there are many other manufacturers of high-performance lamps that likewise produce excellent lamps. Everybody has to check what suits him best. You probably won't get around the purchase of at least a simple lamp for your own open stable. The picture below shows two lamps used by us. You can see well that these lamps are hardly larger than an R6 round cell, even smaller is almost impossible. The solar panel itself. We use a type originally drafted for on-grid usage. But this poses no insurmountable problem for an off-grid installation and has the advantage of a rather high output power, e. g. in our case up to 240W, on sunny days there's plenty of power available. A charge controller for a 12V battery. A type is needed that can cope with the high output power of the solar panel mentioned previously. It is recommended to use a so called MPPT-controller (MPPT = Maximum Power Point Tracking). This type of controller continuously determines the optimum operational point of the solar panel, always providing the maximum energy possible to load the battery. A 12V lead acid battery. In principle this is nothing particularly different than a banal car battery. However the usage of a so called AGM-battery (Absorbent Glass Mat). This design avoids the efficiency decreasing acid layering, as it can appear in a regular car battery if it isn't moved regularly. The battery serves as a buffer store for the solar energy collected during the day. A capacity of about 100Ah will be quite far reaching. An efficient illumination, we exclusively use LED's. Meanwhile these have become quite reasonably priced, very robust, available in waterproof casing (IP65 or even IP67), appropriate models can be operated directly on a 12V power supply and by now have reached a light efficiency equalling or surpassing that of mercury vapour lamps. By this we can illuminate the whole stable at all important places throughout the whole year. The layout as a 12V-facility has the additional advantage that cheap components from the car sector can be used. 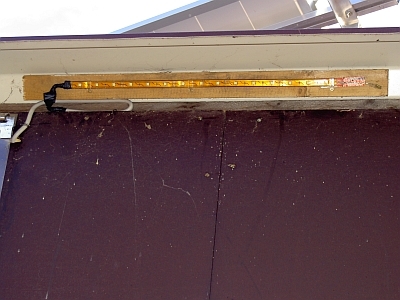 We use two different types of LED-lights, visible on the pictures below. 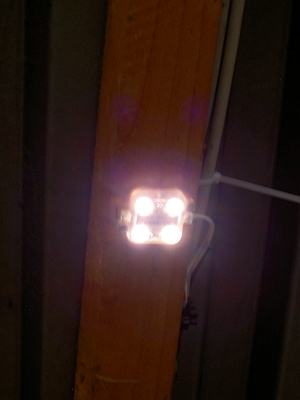 The left version works as a spotlight with four LED's. Three of those spots in every box yield a sufficient brightness e. g. to muck out trouble-free without any unlit shady places. The right version is a small, flexible strip with 15 individual LED's. This yields a more distributed light emission as those of the spots explained before and an illumination similar to those of a small neon tube. We use this strips as an illumination for our store room and as an exteriour lighting in front of the boxes. So e. g. a grooming of the horses is well possible even at night. The next two pictures show the brightness to expect from such an illumination. As can bee seen the shots have been taken in the daytime, so you get a coarse idea of the resulting luminosity. 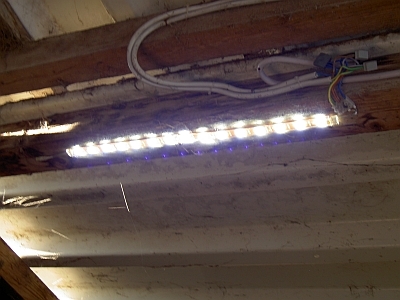 The installed wires for the connection of the luminous elements are all-regular mains cables (German links here only, someone found the corresponding English links?) NYM-J 3x1,5 or NYM-J 5x1,5 for the home installation. These can be easily and securely wired by Wago-fastener (distinctively better than with screw terminals), who wants places the fasteners into a junction box. Also the switches used are the regular version for 230V~, these do operate at 12V= without a hitch, too. The storage battery of the solar collector imperatively must be protected by an appropriately dimensioned fuse mounted as close as possible to the battery. In case of a short-circuit a lead acid battery can, despite its rather low battery voltage in comparison to the regular grid, yield a very high short-circuit current of well above 200A. This is an amperage as is common in electro-welding and in this constellation can quickly lead e. g. to a cable fire. Slapdash, the open stable is ablaze! A solar collector in an off-grid scenario is a conventional electrical installation, too, and therefore should be designed expertly. Who doesn't know the ropes regarding electrical installations and e. g. can't do anything with above notations as NYM-J 3x1,5, to consult a skillful professional and leave over the installation to him is urgently recommended! 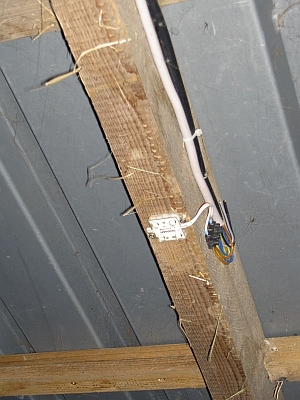 Of course all components of the elctric installation should be installed in a way that the horses at no time have the possibility to closer inspect it or even start nibbling on it! The wires we installed inside of the boxes for the illumination e. g. are invaryably placed on the ceilings, inaccessible for the animals. The rest of the installation like storage battery, charge controller, etc. are located in enclosed housings in areas of our stable inaccessible for the horses.